My husband and I recently joined the YMCA so I can take their fitness classes to rebuild my balance and muscles for my adult beginner ballet class. Given my recent history of buying a new stuff for working out and eventually quitting, I’m making do with what I have until I get past my ”what have I gotten myself into? I don’t think I like this” hump. In the meantime, I’m borrowing the yoga mat Husband has to do floor exercises at home. Sharing is working well since we use it at different times. It doesn’t hurt that we aren’t cluttering our space with extra stuff either. Although there is one teeny, tiny problem with two people sharing the same exercise mat. IT REEKS OF TWO PEOPLE WORKING OUT AND SHARING A YOGA MAT. I became aware of our problem during my second Face Plant Piyo class. Pin this post to Pinterest for later! Share this tutorial with your friends! Now that it is officially Spring, I’m ready to start planning our landscaping. I found a bunch of clever, unusual, and some down right weird ideas for garden borders and edging one day while I was researching what to plant and where to plant it. I thought I’d share because maybe you need new garden borders too. Or you just like to look at garden p*rn. that’s OK too. Save these ideas to Pinterest for later! You are getting excited for the Spring planting season? Although I am not looking forward to how much it will cost us to keep a new landscape watered all summer long. One way to avoid a high summer water bill is to plan my new landscape with native plants. Since I often forget plants need water to grow, they should be drought tolerant too. 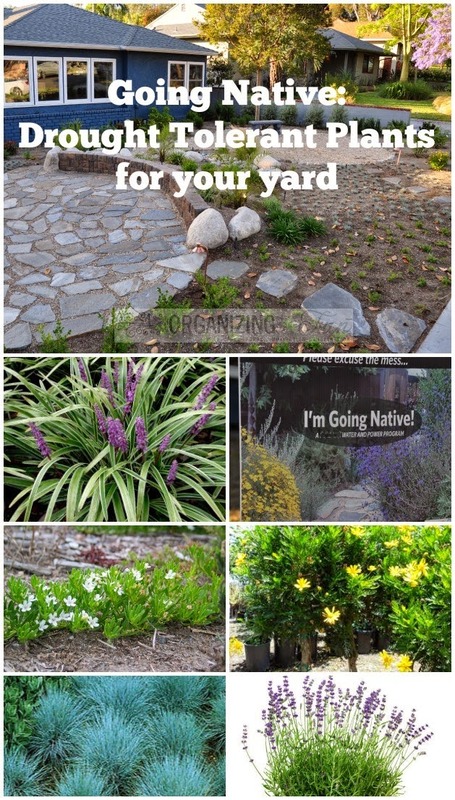 Since I know pretty much nothing about native or drought tolerant plants, I'm cruising over to Organizing Made Fun and reading her 21 suggestions for Going Native: Drought Tolerant Plants for Your Yard. Check it out now and pin it for later! Last summer during a impromptu gathering, my friend Tim and his neighbor Marc when out side to start a fire in the backyard fire pit. Tim (raised voice): No, you are doing it wrong! Marc (bellowing): Well then put on some more! A HUGE fireball erupts over the fire pit! The rest of us tumble out of the house and into the the backyard. Fortunately our friends weren’t charred crispy critters. Oh no. Instead Tim and Marc were a safe distance away and laughing like two naughty kids playing with too much lighter fluid. Au contraire my dear Husband, there are ways to start a fire without lighter fluid. You can start a campfire with homemade fire starters! Spring planning, Spring planting, and spring blooming (hopefully.) Since I have a blank slate in my front yard – again. I am looking for garden and curb appeal inspiration where ever I can get it. Housekaboodle has a fabulous roundup of 10 Cottages with Curb Appeal I pinned to my Pinterest boards (follow Condo Blues on Pinterest pretty please?) and want to share with you. Last Sunday, 60 Minutes investigated Lumber Liquidators Chinese made laminate flooring for unsafe levels of formaldehyde in Lumber Liquidators Linked to Health and Safety Violations. 60 Minutes bought 150 boxes of laminate flooring from several Lumber Liquidators stores throughout Californian. 60 Minutes asked three independent labs to test the samples to see if the formaldehyde in the laminate flooring (mostly in the glue used to make the laminate) meets California’s strict formaldehyde emissions standards, called CARB 2. The lab results showed all of Lumber Liquidators Chinese made laminate flooring was from 6 to 7 times over the state limit and some laminate samples were up to 20 times over the state limit. Lumber Liquidators American made laminate flooring as well as Lumber Liquidators flooring they purchased from Lowes and Home Depot passed testing. 60 Minutes then purchased 31 Chinese made laminate samples from Lumber Liquidators stores in four states and sent the samples to two certified labs for formaldehyde testing. Both labs reported that 30 samples were over the formaldehyde limit, some as high as 13 times. 1 sample of Chinese made laminate flooring passed testinga.